Background & objectives: Salivary gland proteins play a pivotal role in blood feeding, epithelial interactions, and parasite transmission in mosquito vectors. Anopheles culicifacies is a complex of five sibling species, viz. A, B, C, D, and E, with diverse geographical distribution patterns. Among these, sibling species B has been identified as poor vector. Exploring the differentially expressed salivary proteins in An. culicifacies may potentially identify refractoriness factors during malaria parasite maturation and may help to elucidate the mechanism of refractoriness. Methods: A comparative proteomic analysis was carried out using tandem mass tag (TMT) technology combined with LC-MS/MS mass spectrometry and bioinformatics analysis, to identify the differentially expressed salivary gland proteins among An. culicifacies species A (susceptible) and An. culicifacies species B (refractory) mosquitoes. Results: A total of 82 proteins were found to be differentially expressed. Out of these, seven proteins including TRIO, translation initiation factor 5C, glutathione S-transferase, and 5’ nucleotidase were up-regulated, and 75 proteins including calreticulin, elongation factors, fructose biphosphatase, isocitrate dehydrogenase, histone proteins and anti-platelet proteins, etc. were down-regulated in refractory species. Analysis of KEGG pathways showed that the up-regulated proteins were related to fatty acid metabolism and RNA transport pathways. Interpretation & conclusion: This comparative proteomic analysis of susceptible and refractory An. culicifacies salivary gland proteins identifies the plausible role of the differential proteome in immune responses, digestion, energy, and carbon metabolic pathways. This information may serve as a basis for future work concerning the possible role of these proteins in refractoriness dependent metabolic function of mosquitoes. Malaria is a fatal infectious disease caused by the Plasmodium parasite and disseminated by the bite of an infected female Anopheles vector mosquito. Despite the vast efforts in controlling malaria, it affected around 216 million people worldwide in 2016. Anopheles culicifacies is a primary rural malaria vector in India and responsible for approximately 70% of malaria cases. It has been identified as a complex of five isomorphic sibling species, namely A, B, C, D and E based on differences in genetic and biological attributes and vectorial capacity. Among these, naturally occurring An. culicifacies sibling species B has been reported as a poor vector, i.e. refractory to the Plasmodium parasites, which shows varying degree of refractoriness with respect to Plasmodium species and geographical area,. This species has been reported to be fully refractory against Plasmodium vivax and partial refractory against P. falciparum and rodent parasite, that exhibit the characteristics of encapsulated parasites found in the midgut. In earlier publications, the establishment of the refractory strain has been clearly elaborated,. To date, the molecular basis of refractoriness is not well understood, however, two barriers of parasite invasion, i.e. midgut and salivary gland are known to be critical for parasite growth, development and transmission. Salivary gland invasion by sporozoites is one of the most important events of the malaria cycle. The molecular and cellular events that happen during the invasion of parasites in salivary glands have not been described much in mosquito vectors. Earlier studies have also shown the importance of An. freeborni salivary gland in relation to refractoriness. In a study, James have proposed that interfering with the invasion of sporozoites in salivary glands, either before or after the parasite invasion, may serve as one of the methods for control of parasite transmission. This evidence suggests the involvement of the salivary gland in refractoriness and that sparked our interest to study the salivary gland protein profile along with the midgut in An. culicifacies species B. During malaria cycle, parasites in the form of gametocytes are ingested by the mosquito along with the blood meal; that multiplies in midgut and complete their life cycle, and finally invade salivary glands, where they mix with the saliva and are injected into the next vertebrate host. During a bite, several proteins are injected by the mosquito which facilitates blood feeding through different mechanisms like vasodilation, anti-inflammation, inhibition of platelet aggregation and blood coagulation or probably by modulating the immune response,,. Very little is known about this critical step of malaria transmission, i.e. invasion of sporozoites into the salivary glands, ingress and egress point for the parasites. Hence, it is important to study the salivary gland proteins for understanding the parasite transmission and feeding mechanisms. Proteomic approaches have also been utilized to predict salivary gland proteins to be developed as a biomarker of mosquito bites exposure. Several studies on salivary gland proteins have been conducted among sugar fed and blood fed Anopheles species using transcriptomics and proteomics technologies, ,,,. In our previous study, gel-based approaches were used to predict the salivary gland proteins of An. stephensi, and for the comparative analysis of salivary gland proteins among insecticide sensitive and resistant strain of An. stephensi. Recently, the effect of blood meal on the expression of salivary gland proteins in susceptible An. culicifacies mosquitoes were explored using 2DE coupled with mass spectrometry. In this study, TMT technology was implicated for the identification of differential proteins, for understanding the interaction between the salivary gland and parasite invasion. Earlier studies have established that mosquito-parasite relationships are specific and there is a genetic basis for susceptibility and refractoriness of mosquitoes to parasites,. Salivary proteins are directly involved in human-vector contact during probing or feeding and might play a key role in selective parasite survival, competence, and transmission studies that may help in finding the important underlying aspects of refractoriness in poor vector species. 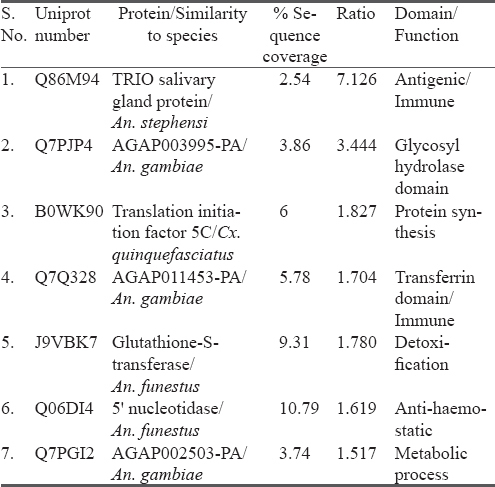 Therefore, in the present study proteomic technologies were used to analyze and compare the differentially annotated salivary gland proteome of susceptible An. culicifacies species A and refractory An. culicifacies species B mosquitoes. The functional annotations of differentially expressed proteins using gene ontology tools may unravel their putative roles in vectorial capacity and biting behaviour to understand the refractoriness dependent annotations for an understanding of the novel malaria control strategies. The present study consists of a roadmap of differential proteomic analysis of sugar fed An. culicifacies species A (susceptible) and An. culicifacies species B (refractory) mosquitoes using TMT labeling approach coupled with LC/MS/MS analysis. Bioinformatics analysis was carried out using various algorithms for functional prediction of identified putative proteins [Figure 1]. Figure 1: Experimental design—A schematic representation of the study protocol of differentially expressed proteins of An. culicifacies species A (susceptible) and An. culicifacies species B (refractory) mosquitoes using TMT labeling approach coupled with LC-MS/MS. The protocols for mosquito rearing were approved by the Animal Ethics Committee of the National Institute of Malaria Research, New Delhi, India (NIMR/IAEC/2017-1/07; dated 28/09/2017). Mosquito colonies of An. culicifacies species A and species B are successfully maintained for many consecutive generations in the insectaria at the National Institute of Malaria Research, New Delhi, India, . Identification and establishment of refractory species B was carried out as described previously. All the mosquitoes were reared and maintained in stable conditions at temperature 27 ± 2 °C and 70 ± 10% relative humidity, a photoperiod of 12 : 12 h (light : dark) and preserved on a 10% sucrose solution. The female An. culicifacies species A and species B mosquitoes (2–3 days-old) were cold anesthetized on ice before salivary gland dissection. Total 100 pairs of salivary glands (n = 100 mosquitoes) were dissected in 100 μ1 phosphate buffered saline (PBS; 10 mM Na2PO4, 145 mM NaCl; pH 7.2) containing protease inhibitors (Complete, Roche Diagnostics, Germany) using fine entomological needles under the stereoscopic microscope at 4× magnification and stored at –80 °C till further use. Salivary gland extract (SGE) was prepared by homogenizing the salivary glands using ultrasonication in lysis buffer (Tris 50 mM, 150 mM NaCl, 1% NP-40 with protease inhibitors, pH 7.4) for 3 pulses of 20 sec each on ice. Salivary gland homogenate suspension was then centrifuged for 10 min at 5000 rpm at 4 °C. The supernatant containing SGE was collected and proteins concentration was quantified by the Bradford method (Sigma Aldrich) using bovine serum albumin (BSA) as a standard. SGE was stored at –80 °C till further investigations. The SGE solution was digested with proteomic grade trypsin (Roche Diagnostics, USA). Briefly, 50 μg of protein lysates were denatured using 4M urea and reduced by incubating with 10m M dithiothreitol (DTT) at 56°C for 1 h. Subsequently, the reduced proteins were alkylated with 25 mM iodoacetamide (IAA) at 25 °C in the dark for 30 min. Further, 100 mM ammonium bicarbonate (pH 8.1) was added to the solution to achieve the final concentration of urea, i.e. 0.5 M. The proteins were then digested by incubating overnight with trypsin at 37 °C (concentration of trypsin was 50 times lower than the protein). This trypsin digest was then cleaned and desalted using Zip-Tip C18 cartridge (Millipore Corp., MA, USA). Further, the desalted peptides were completely dried using a Speed-Vac Evaporator and reconstituted in 2% acetonitrile with 0.1% formic acid for further TMT labeling of peptides. Trypsin digested samples of An. culicifacies species A and B salivary gland proteins were labeled with TMT6-plex system (species A–TMT6126, species B–TMT6127) for their relative quantification using manufacturer's protocol (Thermo Scientific, Waltham, MA). These TMT labeled peptides were mixed in equal ratios. The peptide mixtures were then fractionated to improve MS/ MS peptide resolution. To enhance the MS/MS peptide resolution, these labeled peptides were fractionated using strong cation exchange (SCX) column (Thermo Scientific) equipped with UV detector. The TMT-labeled peptides were eluted from the SCX column using 250, 350 and 450 mM ammonium acetate. All the eluted peptides were lyophilized and re-dissolved in 2% acetonitrile in 0.1% trifluoroacetic acid (TFA). These samples were desalted online using Thermo Scientific's Magic C18 100Å and 5 μ reverse phase trap (100-micron × 20 mm) column and then separated using a Magic C18 200Å and 3μ reverse phase column (75-micron × 150 mm). These eluted samples were lyophilized for the LC-MS/MS analysis. 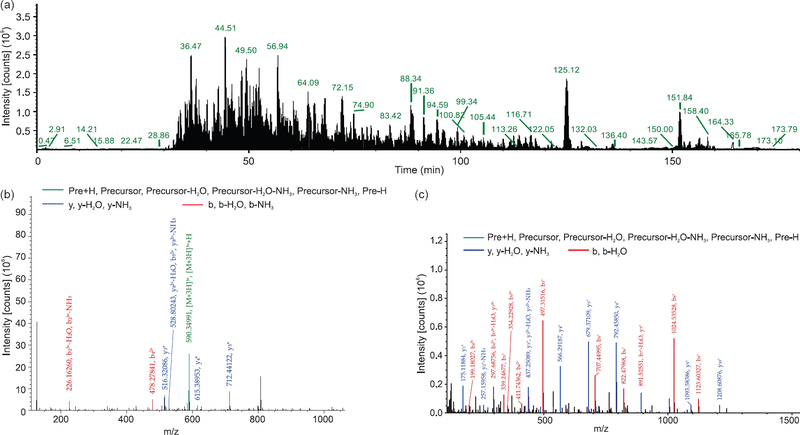 MS/MS analysis was carried out on a Q-exactive orbitrap mass spectrometer using a standard top 15 method coupled with a Proxeon Easy-nLC II HPLC (Thermo Scientific) and Proxeon nanospray ion source. Ions were injected into the mass spectrometer under a spray voltage of 2.0 kV in positive ion mode. The mass spectrometer was operated in data-dependent mode and normalized higher energy collision dissociation (HCD) of 30 was used for fragmentation. MS1 automatic gain control (AGC) was set to 1e6 with an ion trap time of 60 ms. The MS/MS scan range was m/z 300–1600. MS2 AGC was set at 5e4 with ion trap time of 250 ms and a dynamic exclusion was set of 15 sec. The charge states of +1, >+6 and unassigned charge states were excluded for MS/MS selection. Peptides were eluted using gradients of 0.1% formic acid (A) and 100% acetonitrile (B) with a flow rate of 300 nl/ min. The total 180-min gradient was run with 5 to 35% B over 155 min, 35 to 80% B over 10 min, 80% B for 2 min, 80 to 5% B over 3 min, and finally held at 5% B for 10 min. Raw data files were searched using Proteome Discoverer 1.4 (Thermo Scientific, Waltham, Massachusetts, US) software and the SEQUEST HT (Thermo Fischer Scientific, Waltham, Massachusetts, US) algorithm against the most recent species-specific database for mosquito, downloaded from UniProt. The enzyme used was trypsin, that allowed up to two missed cleavages per peptide. Methylthio cysteine, N-terminal TMT2-plex, and lysine TMT2-plex were selected as a static modifications and oxidation of methionine was selected as a variable modification. Precursor mass tolerance was set to 10 ppm and fragment mass tolerance was set to 0.6 Da. Target FDR (false discovery rate) used was 0.01 and only peptides identified with high confidence were used in the protein identification. For TMT quantification, raw data sets were used to calculate the ratios of the TMT reporter ion intensities in MS/MS spectra (m/z 126–127) to obtain fold changes between samples. Upregulated and downregulated proteins were identified based on TMT ratio, i.e. TMT ratio > 1.5: Upregulated, TMT ratio < 0.67: Downregulated; and ratio from 1.5–0.67: Moderate to no change. Bioinformatics analysis of identified putative functional proteins was carried out using gene ontology (GO) algorithm. Conserved domains and signal peptides were predicted using SMART (http://smart.emblheidelberg.de/) and InterProScan (https://www.ebi.ac.uk/interpro/search/sequence-search) analysis. Cellular localization was predicted using CELLO (http://cello.life.nctu.edu.tw/). Protein-protein interaction and KEGG pathways analysis of the identified putative proteins were also carried out to identify the functional enrichment and associated biochemical and metabolic pathways using String version 10 (https://string-db.org/). The mass spectrometry proteomics data analyzed by TMT labeling approach have been deposited to the Proteome Xchange Consortium via the PRIDE partner repository with the dataset identifier PXD005638. 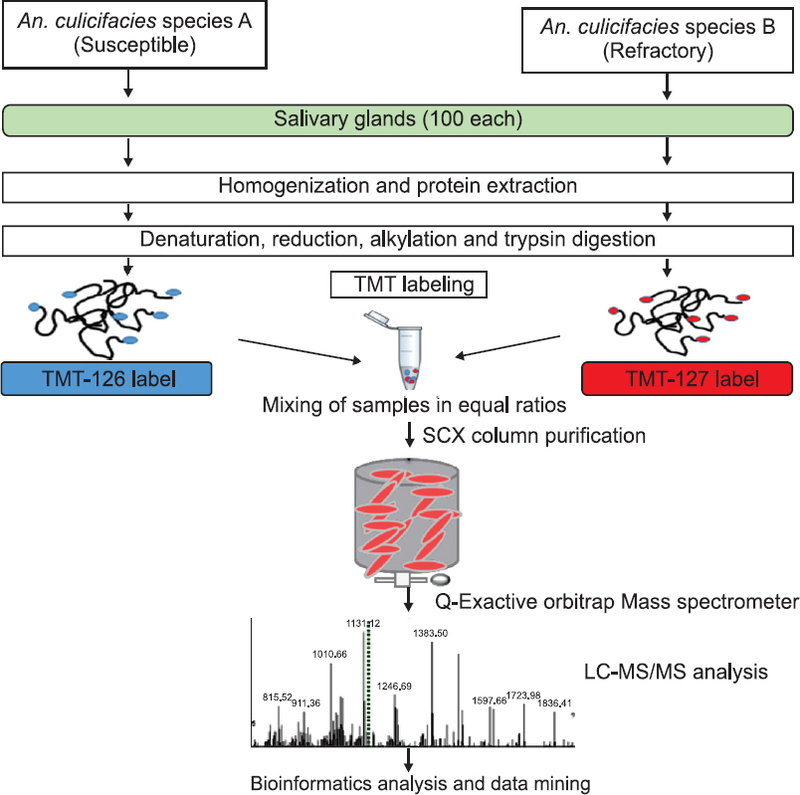 A TMT based labeling approach coupled with LC-MS/MS was employed to identify the differentially expressed salivary gland proteins between An. culicifacies species A (Susceptible) and An. culicifacies species B (Refractory). The total ion chromatogram (TIC) of salivary gland proteins obtained after LC/MS/MS of one fraction (250 mM) is shown in [Figure 2]a. MS/MS spectrum of identified protein, i.e. Trio with peptide DKFNTPVSGK at peak 590.01 m/z (upregulated) and 5’ nucleotidase protein peptide iTGPLDSDVLIEYVR at peak 639.02 m/z (equally expressed) is shown as a representative figure [Figure 2]b and [Figure 2] c. Differential expression analysis between vector and poor vector sibling species using SEQUEST algorithm detected a total of 82 differentially expressed proteins, out of which seven proteins were found to be upregulated, and 75 proteins were found to be downregulated in refractory species of An. culicifacies when compared to susceptible species. All the identified upregulated and downregulated proteins with their TMT fold change are shown in [Figure 3]. Figure 2: TMT based annotation of salivary gland proteins of An. culicifacies between susceptible and refractory species—(a) Total ion chromatogram of LC/MS/MS run of TMT labeled trypsin digested salivary gland proteins; (b) Product ion MS/MS spectrum with peak at m/z 590.01 corresponds to the peptide sequence DKFNTPVSGK matched to TRIO protein of An. stephensi; and (c) MS/MS spectrum with peak at m/z 639.02 corresponds to the peptide sequence iTGPLDSDVLIEYVR matched with 5’ nucleotidase protein of Anopheles funestus. Figure 3: Depiction of TMT analyzed 82 differentially expressed salivary gland proteins in An. culicifacies refractory species with respective fold changes. Total identified up- and downregulated proteins were 7 and 75 respectively. Detailed functional analysis of these proteins was carried out using GO and other bioinformatics algorithms. All the identified putative proteins were categorized into 18 groups according to biological process. Majority of the annotated proteins were predicted to be involved in carbohydrate metabolism (one upregulated and 17 downregulated), followed by energy metabolism (eight downregulated), biosynthesis (seven downregulated), protein synthesis (one upregulated and seven downregulated), cytoskeleton (six downregulated), nuclear function associated (six downregulated), transport (five downregulated), protein folding (three downregulated), signal transduction (three downregulated), unassigned (three downregulated), cell redox haemostasis (two downregulated), protease (two downregulated), anti-haemostatic (one downregulated and one upregulated), stress response (two downregulated), development (one downregulated), calcium haemostasis (one downregulated), diverse functions (one downregulated), cell adhesion (one downregulated), detoxification (one upregulated), immune (one upregulated), iron haemostasis (one upregulated), and metabolic process (one upregulated). All these identified putative proteins according to biological process are depicted in a pie chart [Figure 4]a. Figure 4: Illustration of differentially identified salivary gland proteins of refractory species using gene ontology tool—(a) Biological process; and (b) Cellular localization; Orange colour box shows downregulated and blue colour box shows upregulated proteins. The cellular localization of proteins predicted using CELLO revealed that most of the identified putative proteins were localized in cytoplasm (total 26, out of which three were upregulated) followed by mitochondria (19 out of which one was upregulated), cytoskeleton (seven downregulated), intracellular (seven downregulated), membrane (two upregulated and four downregulated), nucleus (five downregulated), extracellular (one upregulated and three downregulated), unassigned (three downregulated), and structural (one downregulated). 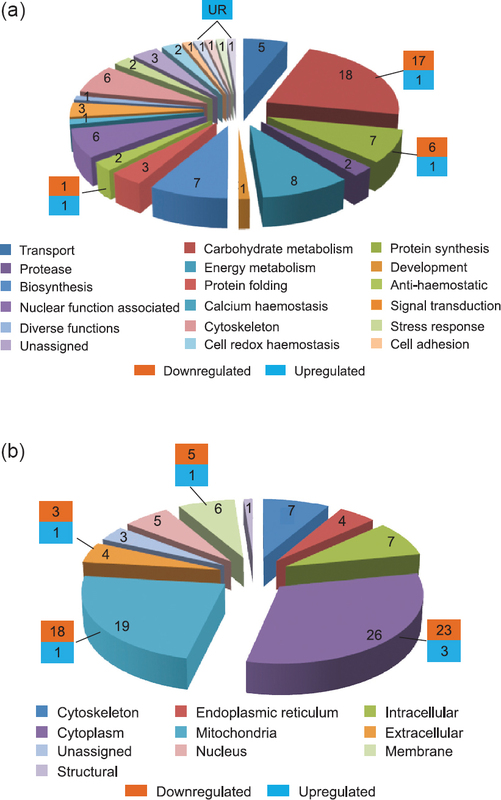 All these putative proteins are shown in the form of a pie chart [Figure 4]b. Molecular functional analysis revealed that most of the identified upregulated proteins belonged to binding proteins, followed by hydrolases, transferases and ligases. Among downregulated proteins also most were binding proteins, followed by oxidoreductases, isomerases, kinases, synthases and proteases. The upregulated proteins in refractory species along with their percent sequence coverage, TMT ratio and putative functional roles are shown in [Table 1] and the downregulated proteins are shown in [Table 2]. Structural, as well as functional networks of proteinprotein interactions of up and down-regulated proteins, were analyzed and predicted using STRING 10 analysis software. String analysis can be used to understand the cellular machinery at the system level, and this information can be implicated in modeling, annotation, and pathway studies. The available association network was studied for upregulated proteins, i.e. AGAP003995-PA (glycoside hydrolase family 31), translation initiation factor 5C and AGAP002503-PA (AMP binding). String network evidence view of protein AGAP 003995-PA (glycoside hydrolase family 31) depicts its interaction with six other proteins of An. gambiae, i.e. protein AGAP005032-PA (Calreticulin), AGAP004609-PA (Glucosidase II beta), AGAP001092-PA (Glucosidase II), AGAP002392-PA (Rab-GTPase-TBC domain), AGAP011492-PA (Major facilitator superfamily domain), AGAP010199-PA (Membrane occupation and Recognition nexus) [Figure 5]a. Protein-protein interaction analysis of translation initiation factor 5C shows its association with other proteins of Culex quinquefasciatus, i.e. protein CPIJ011800-PA (Ankyrin repeats), CPIJ009979-PA (eIF4 gamma 3), CPIJ004849-PA (eIF4 gamma), CPIJ011259-PA (eIF2B) and CPIJ002918-PA (eIF4 gamma) [Figure 5]b. Protein AGAP002503-PA (AMP binding) was found to be associated with other proteins of An. gambiae like AGAP007784-PA (long-chain 3-hydroxy acyl-CoA dehydrogenase), AGAP005662-PA (Acyl-CoA oxidase), AGAP008667-PA (Mao C), AGAP006821-PA (Thiolase), AGAP028164-PA (Acyl-CoA dehydrogenase 2), AGAP028056-PA (Acyl-CoA dehydrogenase), AGAP028014-PA, AGAP008769-PA, AGAP000454-PA and AGAP011827-PA (Thiolase) [Figure 5]c.
Figure 5: STRING networks of identified upregulated proteins in the salivary gland of An. culicifacies refractory species: (a) Protein AGAP003995-PA; (b) Translation initiation factor 5C; and (c) AGAP002503-PA. Different line colours represent the types of evidence for the association. 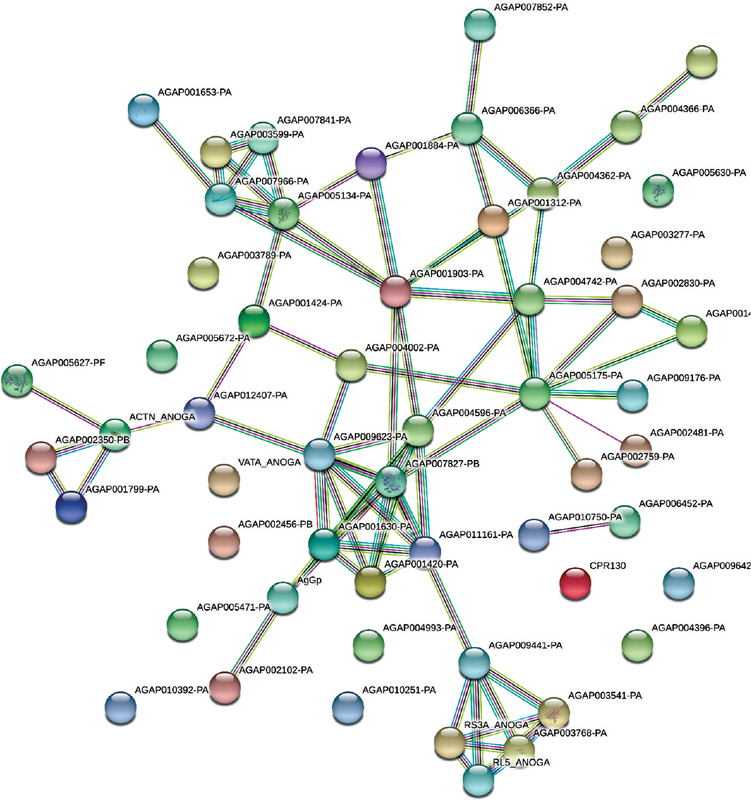 Green colour depicts neighbourhood; Red colour: Gene fusion; Pink colour: Experiments; Light green colour: Text mining; Blue colour: Cooccurrence; Dark blue colour: Coexpression; Purple colour: Homology; and circle nodes indicated different proteins. Interaction networks are shown in evidence view. The STRING database was searched to analyze the protein-protein interactions among all the downregulated proteins. Of these, forty-three proteins were found to be functionally associated with each other with high confidence [Figure 6]. Other downregulated proteins, viz. AGAP007841-PA, AGAP004396-PA, AGAP001903-PA, AGAP001884-PA, AGAP004362-PA, AGAP001312-PA, AGAP004596-PA (Pyruvate kinase), AGAP001420-PA showing interactions with each other were carbohydrate and energy metabolism related proteins. 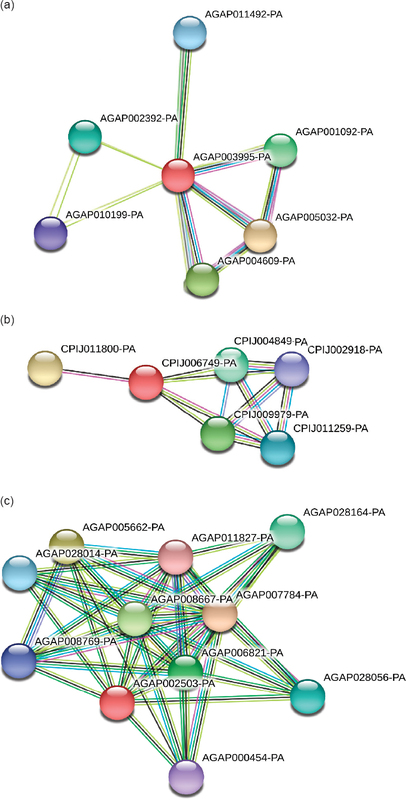 Proteins AGAP003541-PA, AGAP009031-PA, AGAP003532-PA and AGAP003768-PA showing interactions with each other in STRING network analysis were related to protein synthesis. Other proteins that showed interaction with each other were the cytoskeleton, biosynthetic pathway and nuclear function related proteins. All these interactions are shown in [Figure 6]. Figure 6: Protein-protein interaction network of the downregulated proteins predicted in STRING v10 software. Different line colours represent the types of evidence for the association. Green colour depicts neighbourhood; Red colour: Gene fusion; Pink colour: Experiments; Light green colour: Text mining; Blue colour: Cooccurrence; Dark blue colour: Coexpression; Purple colour: Homology; and circle nodes indicated different proteins. Interaction networks are shown in evidence view. To find out the associated biochemical and metabolic pathways, KEGG pathways of differentially expressed proteins were analyzed [Table 3]. Among identified KEGG pathways, the up-regulated proteins were related to fatty acid metabolism and RNA transport pathways. Mostly down-regulated proteins mapped as 17 KEGG pathways namely metabolic pathway (17), protein processing in endoplasmic reticulum (4), starch and sucrose metabolism (2), fatty acid metabolism (2), TCA cycle (4), ribosome (3) and each protein involved in tropomyosin, phototransduction-fly, dorsoventral axis formation, proteosome, RNA transport, phenylalanine metabolism, lysosome, Alanine-aspartate and glutamate metabolism, purine metabolism, endocytosis and ECM-receptor interaction respectively [Table 3]. Malaria parasites are transmitted exclusively by infected female anopheline mosquitoes. While biting, mosquito salivary glands and their secretions are in direct contact with the host and play a central role in host-vector-parasite interactions. Hence, it is important to understand these interactions at the protein level using omics tool, a novel approach. The present study is the first TMT based proteomic approach investigating the differential expression pattern of the salivary gland proteins among susceptible and refractory An. culicifacies mosquitoes. The results showed, seven upregulated proteins in refractory species B that are mainly involved in the immune response, anti-haemostasis and detoxification. Interestingly, a potent immunogenic protein TRIO (signal peptide from 1–25 amino acids) was found to be highly overexpressed with TMT ratio of 7.126 in refractory species B. TRIO is a multidomain protein that binds the lymphocyte activating receptor transmembrane tyrosine phosphatase (PTPase) and contains a protein kinase domain, . Earlier studies in various Anopheles species, i.e. An. gambiae, An. arabiensis, An. stephensi, An. albimanus and An. sundaicus showed that TRIO protein is antigenic and is conserved within the Cellia sub genus, . In Drosophila, TRIO has been proposed to be involved in cell-matrix and cytoskeletal rearrangements necessary for cell migration, , . An earlier comparative study of the salivary gland contents between An. gambiae susceptible and acetylcholinesterase (ace-1R) resistant strains also showed the overexpression of TRIO protein and stated its role in the blood feeding. During probing or blood uptake, TRIO protein might play a role in conjunction with other immunomodulatory or haemostatic enzymes. Another upregulated protein in refractory species was transferrin. It is multifunctional and juvenile hormone-regulated protein. In insects, it has been established as an antioxidant protein with its main role in immune response, iron transport, cell growth and differentiation and inhibition of stress-induced apoptosis,. These results of increased expression of immunogenic proteins in refractory species suggest their role in the immune defense system against parasite. Role of another upregulated protein, α-glucosidase (AGAP003995-PA) with glycoside hydrolase (family 31) domain is in sugar meal digestion,. STRING analysis of this protein depicts its interaction with calreticulin and glucosidase II beta subunit. These are the enzymes of protein processing in ER pathway; Rab GTPase of mTOR signaling pathway and MFS type transporters which act as carrier proteins for sugars, drugs, and metabolites. In a study on a bug Rhodnius prolixus, the α-glucosidases were depicted to be involved in detoxification of cytotoxic heme produced during hemoglobin digestion. Glutathi-one-S-transferase (GST) was also found upregulated in refractory species. It is a member of diverse family of enzymes mainly involved in detoxification and other physiological processes like biosynthesis of hormones and protection against oxidative stress,. GSTs are potent antioxidant enzymes which detoxify Reactive Oxygen Species (ROS). ROS play an important role in determining parasite invasion. An earlier study has demonstrated that an increase in GST activity confers insecticide resistance into the mosquito and it also affects vectorial capacity and competence. Another identified upregulated protein, AGAP002503-PA is a member of fatty acid metabolism pathway. In refractory species, an increased expression of the anti-haemostatic and anti-inflammatory enzyme 5’ nucleotidase (apyrase) was also observed. It prevents ADP-induced platelet aggregation and neutrophil activation in the host and thereby facilitates blood feeding,. It has been reported that while blood feeding the increase in the activity level of apyrase is directly related to decrease in probing time. In An. gambiae, the expression of apyrase was found to be decreased in Plasmodium berghei-infected mosquito salivary glands. These studies illustrate the role of 5’ nucleotidase on probing time and Plasmodium infection that may influence the parasite transmission. This study also observed the increased expression of translation initiation factor 5C in refractory species B. It is related with RNA transport pathways and play an important role in regulating gene expression. The protein-protein interaction network shows its association with protein CPIJ011800-PA (tyrosine-protein kinase shark) which is an enzyme of MPK signaling pathway, and translation initiation factors like 4 γ [Table 3]. Eukaryotic initiation factor 5C was also reported to be upregulated during metamorphosis in the cotton bollworm, Helicoverpa armigera. Given the potential functions of these upregulated proteins in response to refractoriness, they are believed to participate in the immune defense and metabolic process of the mosquitoes and may serve as new targets for continued research towards overcoming vectorial capacity and parasite transmission. However, detailed studies on these putative proteins are still required. Further, among the 75 identified down-regulated proteins, 17 proteins were involved in carbohydrate metabolism including aconitase, a phosphorylase, AGAP001903-PA (L-Malate dehydrogenase), pyruvate kinase, AGAP006366-PD (Oxoglutarate dehydrogenase), fructose-bisphosphate aldolase, pyruvate carboxylase, etc. [Table 1]. An earlier study reports that downregulated protein aldolase is not only required for carbohydrate metabolism but also essential for bridging adhesin-cytoskeletal interactions for efficient parasite invasion of host cells. The underexpression of several glycolytic and tricarboxylic acid pathway enzymes might be a modulation in poor vector species to save energy and could be responsible for inhibition of metabolic process or further development of the parasite in the refractory mosquito. Similar alterations in metabolism-related enzymes like aconitase, isocitrate dehydrogenase have been reported in parasite infected Aedes albopictus salivary gland. It can be further speculated that these changes can be responsible for variation in vectorial capacity among susceptible and refractory species of An. culicifacies. Further, a total of eight downregulated proteins were found to be involved in energy metabolism, viz. ATP synthase subunit α, AGAP001653-PA (NADH dehydrogenase), AGAP005627-PC (ATP guanidotransferase), B subunit V-ATPase, V-type proton ATPase catalytic subunit A, ATP synthase subunit γ, AGAP003599-PA (ATP synthase subunit δ ) and AGAP007841-PA (ATP synthase subunit ε ). V-type ATPases and ATP synthase subunit α are involved in ATP metabolic process and are the major source of energy utilized for secretions. The V-type ATPases have role in saliva secretion in dipterans which facilitates the saliva mediated parasite transmission to the host,. Increased level of V-ATPase has been reported in Indian meal moth (Plodia interpunctella; belonging to order Lepidoptera and family Pyralidae) resistant to Bacillus thuringiensis toxins depicted to combat toxin stress. The expression of some of the cytoskeletal proteins like troponin, tropomyosin, and myosin tail has been found to be highly downregulated with TMT ratio of 0.112, 0.276 and 0.303 respectively. The string interaction network and KEGG pathway analysis showed that these proteins are members of the phototransduction-fly pathway. Other cytoskeletal proteins found to be downregulated were chitin binding protein, actin and actin-binding protein. These proteins are involved in cytoskeletal rearrangements that occur during parasite infection and could affect parasite survival in the vector. Further, the proteins involved in protein synthesis, transport, signal transduction, cell redox haemostasis, stress response, proteolysis, and nuclear function were also found to be down-regulated in refractory species that may be related directly or indirectly with limiting parasite growth. Reduced expression of such proteins in refractory species suggests their role in inhibiting the growth and development of the parasite. Though, several studies have been conducted on salivary gland proteins in various mosquito species, this is the first study which used a proteomic approach to identify the role of salivary gland proteins in susceptible and refractory species of An. culicifacies using TMT labeling technology, mass spectrometry and bioinformatics tools. For the first time, this study highlighted the upregulation of potential antigenic proteins and carbohydrate metabolic process related proteins and down-regulation of proteins involved in carbon and energy metabolism that might be linked with vector competence and poor parasite transmission in refractory mosquitoes. Further, the KEGG pathway analysis indicated that upregulated proteins were related to fatty acid metabolism and RNA transport pathways and downregulated proteins were mostly found to be related with metabolic processes, protein processing in the endoplasmic reticulum, starch and sucrose metabolism pathways etc. This information related to An. culicifacies may help us to elucidate refractoriness dependent annotations, as diagnostics and molecular mechanisms triggered by these proteins may directly or indirectly impact the vectorial capacity and biting behaviour of Anopheles mosquitoes which can be implicated in bringing of promising strategies to control malaria transmission. World Malaria Report, 2016. Geneva: World Health Organization. Available from: http://www.who.int/malaria/publications/world-malaria-report-2016/report/en/ (Accessed on April 4, 2016). Sharma AK, Tyagi V, Singh S, Veer V, Agrawal OP, Sulumaran D. Distribution of Anopheles culicifacies and detection of its sibling species E from Madhya Pradesh: Central India. J Arthropod-Borne Dis 2014; 8(2): 186-96. Subbarao SK. Anopheline species complexes in Southeast Asia. SEARO Tech Pub No.18, 1998. New Delhi: World Health Organization Regional Office for South-East Asia. Available from: http://apps.searo.who.int/pds_docs/B2406.pdf (Accessed on April 4, 2016). Adak T, Kaur S, Singh OP. Comparative susceptibility of different members of the Anopheles culicifacies complex to Plasmodium vivax. Trans R Soc Trop Med Hyg 1999; 93: 573-7. Adak T, Singh OP, Nanda N, Sharma VP, Subbarao SK. Isolation of a Plasmodium vivax refractory Anopheles culicifacies strain from India. Trop Med Intl Health 2006; 11(2): 197-203. Vijay S, Rawat M, Adak T, Dixit R, Nanda N, Srivastava S, et al. Parasite killing in malaria non-vector mosquito Anopheles culicifacies species B: Implication of nitric oxide synthase upregulation. PLoS ONE 2011; 6(4): e18400. Rosenberg, R. Inability of Plasmodium knowlesi sporozoites to invade Anopheles freeborni salivary glands. Am J Trop Med Hyg 1985; 34(4): 687-91. Mueller AK, Kohlhepp F, Hammerschmidt C, Kristin Michel K. Invasion of mosquito salivary glands by malaria parasites: Prerequisites and defense strategies. Int J Parasitol 2010; 40(11): 1229-35. James AA. Blocking malaria parasite invasion of mosquito salivary glands. J Expt Biol 2003; 206(pt 21): 3817-21. Choumet V, Carmi-Leroy A, Laurent C, Lenormand P, Rousselle JC, Namane A, et al. The salivary glands and saliva of Anopheles gambiae as an essential step in the Plasmodium life cycle: A global proteomic study. Proteomics 2007; 7: 3384-94. Ribeiro JM, Mans BJ, Arca B. An insight into the sialome of blood feeding Nematocera. Insect Biochem Mol Biol 2010; 40(11): 767-84. Ribeiro JM, Arca B. From sialomes to the sialoverse: An insight into salivary potion of blood-feeding insects. Adv Insect Phys 2009; 37: 59-118. Ribeiro JM. Blood-feeding arthropods: Live syringes or invertebrate pharmacologists? Infect Agents Dis 1995; 4(3): 143-52. Armiyanti Y, Nuryady MM, Arifianto RP, Nurmariana E, Senjarini K, FitriL E, et al. Detection of immunogenic proteins from Anopheles sundaicus salivary glands. Rev Soc Bras Med Trop 2015; 48(4): 410-6. Das S, Radtke A, Choi YJ, Mendes AM, Valenzuela JG, Dimopoulos G. Transcriptomic and functional analysis of the Anopheles gambiae salivary gland in relation to blood feeding. BMC Genomics 2010; 11: 566. Sor-suwan S, Jariyapan N, Roytrakul SK, Paemanee A, Saeung A, Thongsahuan S, et al. Salivary gland proteome of the human malaria vector, Anopheles campestris-like (Diptera: Culicidae). Parasitol Res 2013; 112: 1065-75. Jariyapan N, Roytrakul S, Paemanee A, Junkum A, Saeung A, Thongsahuan S, et al. Proteomic analysis of salivary glands of female Anopheles barbirostris species A2 (Diptera: Culicidae) by two-dimensional gel electrophoresis and mass spectrometry. Parasitol Res 2012; 111 (3): 1239-49. Sharma P, Sharma S, Mishra AK, Thomas T, Das De T, Rohilla SL, et al. Unraveling dual feeding associated molecular complexity of salivary glands in the mosquito Anopheles culicifacies. Biology Open 2015; 4(8): 1002-15. Vijay S, Rawat M, Sharma A. Mass spectrometry based proteomic analysis of salivary glands of urban malaria vector Anopheles stephensi. Bio Med Res Int 2014; 2014: 12. Vijay S, Rawal R, Kadian K, Raghavendra K, Sharma A. Annotated differentially expressed salivary proteins of susceptible and insecticide resistant mosquitoes of Anopheles stephensi. PLoS One 2015; 10(3): e0119666. Rawal R, Vijay S, Kadian K, Singh J, Pande V, Sharma A. Toward a proteomic catalogue and differential annotation of salivary gland proteins in blood fed malaria vector Anopheles culicifacies by mass spectrometry. PLoS One 2016; 11 (9): e0161870. Billingsley PF, Sinden RE. Determinants of malaria-mosquito specificity. Parasitol Today 1997; 13(8): 297-301. Hardy JL, Houk EJ, Kramer LD, Reeves WC. Intrinsic factors affecting vector competence of mosquitoes for arboviruses. Ann Rev Entomol 1983; 28: 229-62. Francischetti IMB, Valenzuela JG, Pham VM, Garfield MK, Ribeiro JMC. Toward a catalog for the transcript and protein (sialome) from the salivary gland of the malaria vector Anopheles gambiae. J Exp Biol 2002; 205(pt 16): 2429-51. Fontaine A, Fusai T, Briolant S, Buffet S, Villard C, Baudelet E, et al. Anopheles salivary gland proteomes for major malaria vectors. BMC Genomics 2012; 13(1): 614. Lin MZ, Greenberg ME. Orchestral maneuvers in the axon: Trio and the control of axon guidance. Cell 2000; 101(3): 239-42. Cornelie S, Rossignol M, Seveno M, Demettre E, Mouchet F, Djègbè I, et al. Salivary gland proteome analysis reveals modulation of anopheline unique proteins in insensitive acetylcholinesterase resistant Anopheles gambiae mosquitoes. PLoS One 2014; 9(8): e103816. Kim BY, Lee KS, Choo YM, Kim I, Je YH, Woo SD, et al. Insect transferrin functions as an antioxidant protein in a beetle larva. Comp Biochem Physiol Part B Biochem Mol Biol 2008; 150(2): 161-9. Lee KS, Kim BY, Kim HJ, Seo SJ, Yoon HJ, Choi YS, et al. Transferrin inhibits stress-induced apoptosis in a beetle. Free Radic Biol Med 2006; 41(7): 1151-61. Moreira-Ferro CK, Marinotti O, Bijovsky AT. Morphological and biochemical analyses of the salivary glands of the malaria vector, Anopheles darlingi. Tissue Cell 1999; 31: 264-73. Marinotti O, James AA. An α-glucosidase in the salivary glands of the vector mosquito, Aedes aegypti. Insect Biochem Mol Biol 1990; 20(6): 619-23. Mury FB, daSilva JR, Ferreira LS, dosSantos Ferreira B, deSouza-Filho GA, et al. Alpha-glucosidase promotes hemozoin formation in a blood-sucking bug: An evolutionary history. PLoS One 2009; 4(10): e6966. Enayati AA, Ranson H, Hemingway J. Insect glutathione transferases and insecticide resistance. Insect Mol Biol 2005; 14(1): 3-8. Kostaropoulos I, Mantzari AE, Papadopoulos AI. Alterations of some glutathione-S transferase characteristics during the development of Tenebrio molitor (Insecta: Coleoptera) Insect Biochem Mol Biol 1996; 26: 963-9. Ranson H, Hemingway J. Mosquito glutathione transferases. Methods Enzymol 2005; 401: 226-41. Tripathy A, Samanta L, Das S, Parida SK, Marai N, Hazra RK, et al. The mosquitocidal activity of methanolic extracts of Lantana cramera root and Anacardiumoccidentale leaf: Role of glutathione-S-transferase in insecticide resistance. J Med Entomol 2011; 48(2): 291-5. Tripathy A, Mohanty AK, Kar SK. Role of glutathione-S transferase (GST) in mosquito physiology and anti-plasmodial activity. Int J Scientific Res Pub 2016; 6(5): 2250-3153. Ribeiro JM, Francischetti IM. Role of arthropod saliva in blood feeding: Sialome and post-sialome perspectives. Annu Rev Entomol 2003; 48: 73-88. Champagne DE, Smartt CT, Ribeiro JM, James AA. The salivary gland-specific apyrase of the mosquito Aedes aegypti is a member of the 5’-nucleotidase family. Proc Natl Acad Sci 1995; 92(3): 694-8. Ribeiro JM. Blood-feeding in mosquitoes: Probing time and salivary gland anti-haemostatic activities in representatives of three genera (Aedes, Anopheles and Culex). Med Vet Entomol 2000; 14(2): 142-8. Dong DJ, Wang JX, Zhao XF. A eukaryotic initiation factor 5C is upregulated during metamorphosis in the cotton bollworm, Helicoverpa armigera. BMC Dev Biol 2009; 9(1): 19. Starnes GL, Coincon M, Sygusch J, Sibley LD. Aldolase is essential for energy production and bridging adhesin-actin cytoskeletal interactions during parasite invasion of host cells. Cell host Microbe 2009; 5(4): 353-64. Zhang M, Zheng X, Wu Y, Gan M, He A, Li Z, et al. Differential proteomics of Aedes albopictus salivary gland, midgut and C6/36 cell induced by dengue virus infection. Virology 2013; 444(1–2): 109-18. Ribeiro JM, Arca B, Lombardo F, Calvo E, Phan VM, Chandra PK, et al. An annotated catalogue of salivary gland transcripts in the adult female mosquito, Aedes aegypti. BMC Genomics 2007; 8: 6. Zimmermann B, Dames P, Walz B, Baumann O. Distribution and serotonin-induced activation of vacuolar-type H+-ATPase in the salivary glands of the blowfly Calliphora vicina. J Exp Biol 2003; 206(11): 1867-76. Kariithi HM, Boeren S, Murungi EK, Vlak JM, Abd-Alla AMM. A proteomics approach reveals molecular manipulators of distinct cellular processes in the salivary glands of Glossina m. morsitans in response to Trypanosoma b. brucei infections. Parasit Vectors 2016; 9(1): 424. Candas M, Loseva O, Oppert B, Kosaraju P, Jr Bulla LA. Insect resistance to Bacillus thuringiensis: Alterations in the Indian meal moth larval gut proteome. Mol Cell Proteomics 2003; 2(1): 19-28.